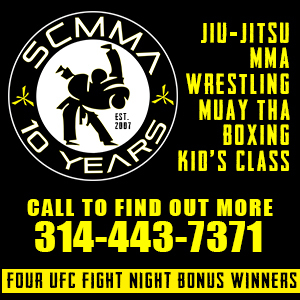 There were many prominent headlines throughout 2016 in St. Louis MMA. It started off when one of our own, Andrew Sanchez, who built his amateur and the early portion of his pro career here, not only made it onto The Ultimate Fighter but ended up winning the whole thing. In the summer, Michael Chandler returned to his home state and in front of a rowdy Scottrade Center, and won for the second time in his career, the Bellator lightweight championship. Chandler won in devastating fashion, uncorking a KO bomb in the first round. Speaking of devastation, Tyron Woodley became the first St. Louis fighter to earn UFC gold when he derailed Robby Lawler with one of his patented right hands. 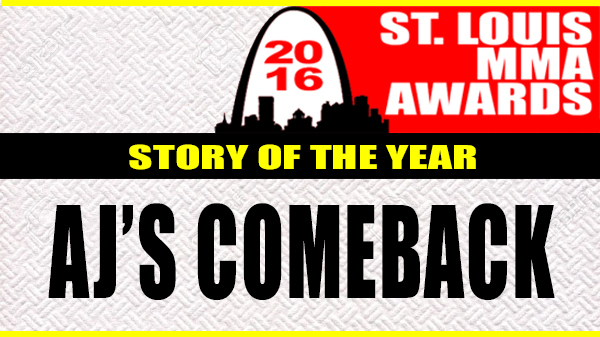 But the headline that was nearest and dearest to our heart was the return of AJ Siscoe, the 2016 STL MMA Story of the Year. After a brief feeling out process, Siscoe went to his ground game, getting to side control and putting a knee on the belly as he roughed Hernandez up. Hernandez did latch onto a neck coming out of a scramble, but Siscoe defended well. Near the two-minute mark, the pace dropped and the two were snarled in a grappling exchange. Siscoe muscled through an armbar attempt and the two ended the round trading punches inside Hernandez's guard. Siscoe ended up getting the victory by rear naked choke in the second round and the River City Casino exploded with applause. Siscoe had won six of his last eight amateur fights before turning pro in April 2015. His venture into the pro ranks had been met with two submission losses, but whether or not Siscoe was inflicted with cancer during that time is up to debate between his doctors. "My first goal was that I was going to beat this and get back to fighting, my second goal is to get back to Bellator, and my third goal, which is most important out of all of this, was that I was going to change somebody's life who has been given something terrible and change it for the positive," Siscoe told KJ. "If my story reaches one person that needs it then it is worth every second that I put into it. I'm 0-2 right now. If I can turn this around I'm going to give back to someone and show them that they can do anything. It's going to get to someone who needs it."